To paraphrase two-trick pony Rahul Gandhi, there are two Karnatakas. One eats avocados; the other eats avare kayi. 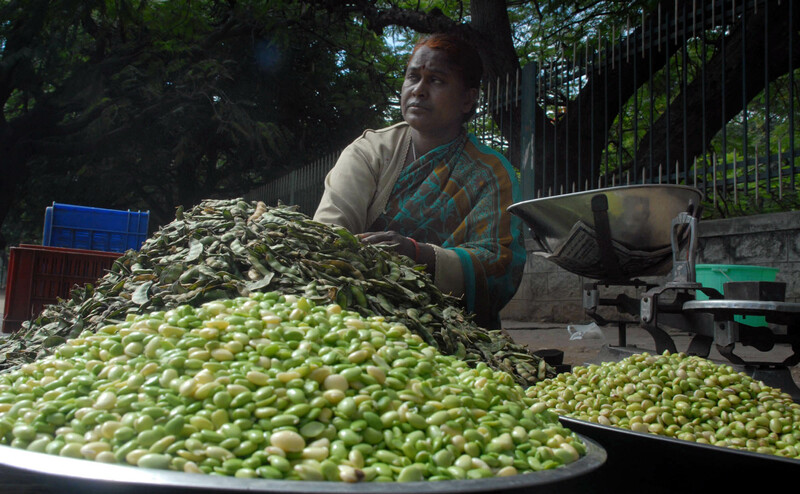 For parochial connoisseurs of flat beans, the doors of paradise are beginning to slowly open in Basavanagudi in the city of baked beans aka Bangalore. For geographically less fortunate folk, there are always online huli recipes, saaru recipes or kurma recipes to gawk at. Or hurugaalu. This entry was posted in Food, Kannada & Karnataka, Mysore-Bangalore and tagged Avare Kaayi, Avarekai, Avocados, Churumuri, Flat Beans, Karnataka Photo News, KPN, Rahul Gandhi, Sans Serif. Bookmark the permalink. Cool! She is the lady I buy avarekalu from! Probably the single biggest reason why people from Old Mysore region are generally more content in life compared to Karavali/North Karnataka natives. They all work harder than us folks. We have the avare kayi, so we don’t have to. why will non kannadigas not like it? we dont have enough marketing enterpreneurs who can says with guts – this is kannadiga product like the haldirams , now that MTR never wanted to expand abbreviation. Didn’t quite understand the purpose though it is a nice snap. localy grown/bred edibles are liked due to abundance/availability. It’s wrong to expect a Naga to eat Avare Kaalu and fart! Kannadiga who is a master in scientific cooking with bhattara aduge , malenadu aduge mysuru aduge and so on has forgotten to market it which has let the rejected FDI and anonymously dangerous invasions of GE GM crops unsuitable for our DNAs , to peek into the peace of mind of the lady sitting in midst of finely chosen averekayis and to the peace of stomach for the dharani mandala madhyadolaina think tank of karnataka and mankind as a whole. she is not there for competition but for a social service with genetic studies giving stiff competition to mendel’s statistical approach as every Kannadati does on amavasye poornime basis mocking them as festivals challenging lunar and tidal changes on humans with her sumptuos meals. See what our dangerous enterpreneurs having malignant narcissism are advocating these days even when day in and day out their ideas like UID get rejected. Of all the people and ethics in the world it seems we have to learn character from his nepoto seismically bred parochial tamils – things would have been different in karnataka APMCs and industrial sector if only achcha kannadati (now dont call her a brahmanagitti) Sudha had invested her dowry on these authentic avarekayi ladies , than a old tamil mistaken to be a old mysurean. Well the pinnacle of avare kayi is when it is had with mutton. If the mutton is from Bannur/Malavalli, then nothing like it. Why does EVERYTHING have to be reduced to “non-Kannadigas” vs. “Kannadigas”? Even as a passing or sarcastic reference? Really getting fed up of churumuri! Marketing is the answer sir. You have to advertise your product, bombard it and sell. People – irrespective of regions, accept eatables if it is really good, (tasty). When South Indians readily accept chats, paratha, lassi, Chhola Bhatura, Bengali sweets etc. and when North Indians savour Idli sambar, vada, dosa, why not our good old Avarekai. Nowadays I have seen school children relishing Mayyas’ Kodubale, cornflakes, kharada avalakki etc. for the breaks, who probably make faces in their houses if the very home made things are given for eating! Advertise it, splash it with catchy ads, market it. Jai ho Avarekai. Soon, we will have shortage of Avarekari due to increased demand! However, beware of side effects please (winds….!). I’m unable to view photos on churumuri.. Any suggestions anyone? Lets not be so self depricating. Kannadigas havent been that bad in marketing our wares. Our udupi chains have changed the breakfast patterns across the land. and have you tried Thatte Idli at Kyathsandra with avareka palya? Kaangeya, i used to drive from mysore to kyathsandra sometimes just for thatte idli. The village side of mysore -mandya -tumkur districts during early morning winter simply rocks. Adding to that, hot thatte idli, avarekayi palya, huLi, saaru is nothing short of swarga. I am also a Tam-brahm from Kumbakonam but more than that a simple mysore kannadiga bomman. Good one! Avrekai in Avocado and cheese dip! Yummies for tummies! How about the immortal husli? @Doddi Buddi – Thanks. Avrekai usli would certainly rank among the top. So tasty and nutritious! good comments – i like such loyalty. keep it up. can’t believe people can forget avarekal uppittu !! with kothambari soppu and kaayi thuri. nimbe huli … can’t stop salivating. wasn’t there a dialogue of sudhir or some villain on avarekal!? how did it originate? ragi mudde with plain bolied averekalu upsaaru also provides the necessary celibacy.